Elysium is a pretty striped blanket with a simple but interesting ripple pattern that crochets up quickly. It is a very special blanket pattern to me and I am so glad that it had such a positive response at Yarndale - my copies sold out and I ended up taking orders for more! I designed Elysium to be a warm and cozy throw, or a thoughtful gift for a new baby. It has a simple repeating ripple pattern and uses eight colours of DK weight yarn. I used Woolyknit Blue Faced Leicester DK for my blanket in colourways Iron, Gold, Mist, Silver, Peridot, Cream, Mint and Mauve. Elysium has a lot of texture not normally found in ripple patterns with stitches crocheted together and the use of front and back loops between rows. Fear not though, Elysium is a beginners pattern with just a two row repeat that is easy to learn. The pattern comes in three sizes: small, medium and large. The small is perfect for a baby blanket and the large makes a cozy throw for a sofa or bed. The name Elysium means 'the place at the ends of the earth to which certain favoured heroes were conveyed by the gods after death' or 'a state or place of perfect happiness'. It was a word that meant a lot to my Dad and I named this pattern for him. It was designed and begun whilst caring for him during his last weeks and provided a lot of comfort to me as we said goodbye. It is now a warm hug in my living room whenever I need it. Elysium can be purchased here, I hope you enjoy making it as much as I did. Can you believe it has already been a week since Yarndale? I enjoyed this year so much, this week has felt very sad knowing that there are 363 days until the next one. Thank you to everyone who came to my stall, it was lovely to meet you all. I do have the most lovely customers! I am sure you have no idea how much it means to me to get such lovely feedback on my designs but I am still on a post-Yarndale high. It was great to hear that things were travelling home to all over the country, and abroad - South Africa, Australia, USA, Netherlands... it is great that people are travelling so far to visit. It was also great to know that you like the designs in my new book. The next Winter Blooms design (there is a sneaky pic of it above if you can spot it) went down very well and I hope to release this in a few weeks time. My Elysium crochet blanket pattern sold out, I am sorry if you missed out on getting a copy. I will be uploading the pattern to Ravelry next week - newsletter subscribers will get a discount so sign up now if you have not already! I did not get much chance to look around but I managed to get a few photos of the fantastic yarn bombing outside. The Shaun the Sheep was my favourite. The knitted and crocheted heart display was amazing to see. I am so glad it raised so much money for charity. Well done to all those who made hearts and bought them. As usual the Yarndale team, volunteers and security staff all deserve a huge thanks for putting on a fantastic festival. I am sure it gets better each year and I am really grateful for being an exhibitor at this wonderful event. There is a little bit of gorgeous Lichen and Lace sock yarn still available and I will be updating the website later this week so keep an eye out if you missed out. The colourways are gorgeous and it goes well with both my The Chain and Florens sock patterns and the Faradrim fingerless mittens patterns. If you did not make it to Yarndale this year, Cathrinksey made a lovely video showing just what a riot of colour and yarn this festival is. She very kindly shows my stand at 2.57 - thanks! Gillyflower is the fifth pattern to be released from Winter Blooms, and the last pattern before Yarndale this weekend. I used the gorgeously soft Lichen and Lace 80/20 bulky in Linen and Wildflowers to knit this very cozy cowl. Just one skein of each colour is needed and it knits up a dream. Garter stitch rib borders a simple slip stitch pattern that shows off the yarn colours perfectly. This cowl is great for beginner knitters as only one colour is worked in a row and it can be made in an evening. It is so cozy, this cowl is a warm woolly hug and the perfect winter accessory. Gillyflower can be purchased on its own or as part of the Winter Blooms e-book or pre-order print book. I am getting ready for Yarndale now, I hope to see you there as it is a fantastic event in the woolly calendar and great fun. Yesterday I released Maiden Pink, the fourth design from my Winter Blooms collection. Maiden Pink is a sweet cozy jumper knitted in chunky yarn with a simple stranded pattern. My Nan had Maiden Pinks growing in her rockery and I have always liked their pretty pink flowers with feathered edges. There is a simple stranded pattern around the empire waist and this is echoed on the cuffs of the sleeves and hips. The jumper starts with an i-cord neck edging and is then knit in the round top-down. The lower edge and sleeve cuffs are finished with i-cords making this completely seamless. Princess-line shaping makes this fitted jumper flattering and it can be knitted longer for extra length if required. 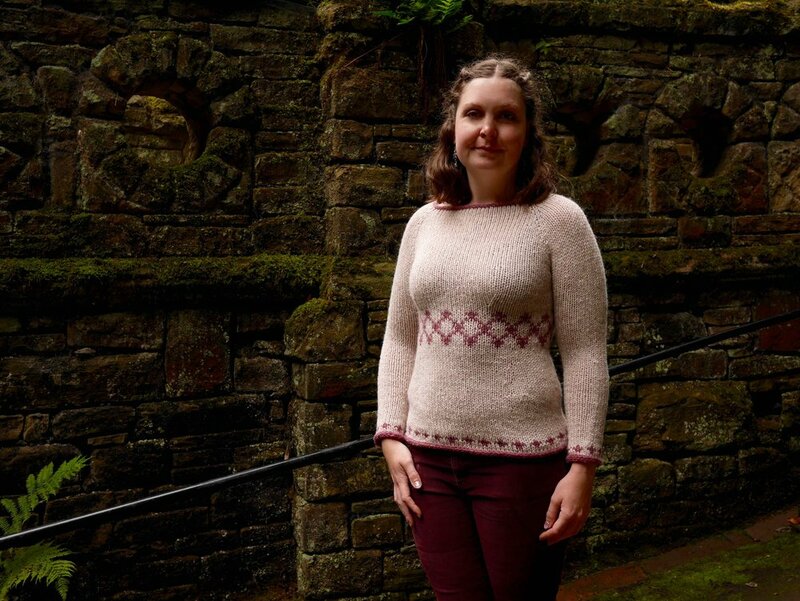 I used New Lanark Wool & Textiles Chunky 100% Wool for this design as it is great for warm winter clothing and they have lovely colours that work well for simple stranded knits. Maiden Pink is a great option for a first colourwork sweater as the pattern is simple to remember, there are no long floats and the chunky yarn knits up very quickly. I may well be wearing this soon... Winter is definitely coming and the evenings are getting quite chilly! Frostberry hat and mittens are the next two patterns to be released from my Winter Blooms collection. A matching set that are full of pretty berries and finished with a super-soft pompom, perfect to keep you warm in cold climates. 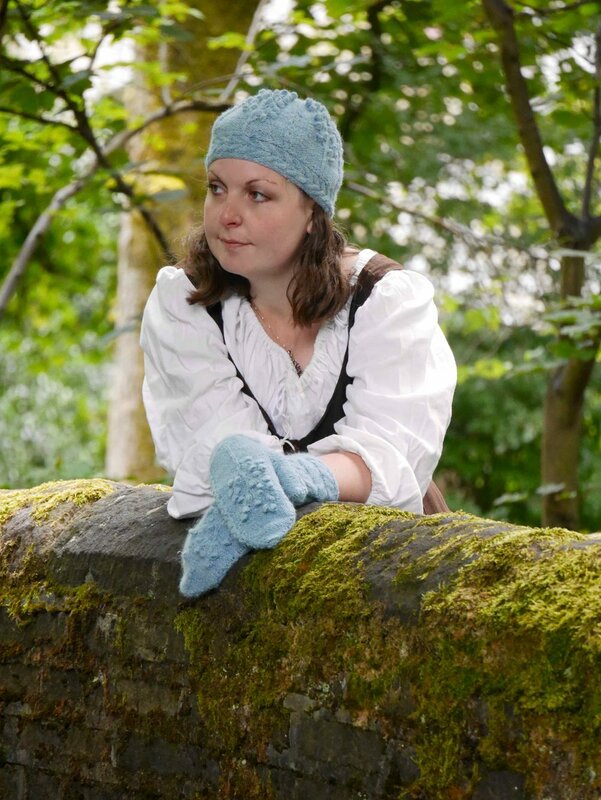 Both the hat and mittens are knitted in the round from the top down. The brim is knitted on sideways so there is no seaming and has a cable design for extra warmth. I have knitted these in Shilasdair luxury DK with camel. I loved working with this yarn. It shows the pattern details well but is so soft to touch and does feel very luxurious. The pompom is from Toft Alpaca and is just so soft and fluffy! It makes the perfect trim to this hat. Frostberry hat and mittens patterns can be purchased together as pattern or purchased as part of the Winter Blooms e-book or pre-order print book. Winter really feels as though it is coming this week and I had better get knitting a hat and mitten set for myself as it is getting quite chilly here in Yorkshire. Winter is coming and I am very excited to release my Winter Blooms book today! Weirwood just had to be the first pattern and the cover photo of the book and I have loved designing and knitting this long flowing cardigan. Weirwood trees are one of the signature images from the Game of Thrones TV series, with the beautiful white trunked trees with five-pointed crimson leaves growing during the opening credits. Within the stories they are sacred trees and many scenes take place under their bows. This became the inspiration for the yoke leaf pattern of this cardigan, and the long length represents the tall white trunk of the tree. The sleeves are flared and the garment just swings when you walk with such lovely drape in this yarn. I used baa ram ewe Titus yarn in White Rose for the main colour and Heathcliff, Rose Window, Bantam and Coal as the colours for the leaf stranded pattern. The cardigan is simple to knit as it is knitted in one piece and then steeked - which is far easier than it sounds! The gentle waist and hip shaping gives an elegant look and the wider neck suits many shapes. The buttons are ones that I sell in my shop and just fasten the yoke together, allowing the rest of the cardigan to flare and swing. Weirwood is available now for instant download as an individual pattern or can be purchased with the e-book. The next two patterns will be released on Sunday 17th September. As I mentioned in my last post, the patterns will be updated over the next year to the book but it can be purchased now as an e-book or pre-ordered as a print copy with a free e-book. Winter Blooms is my new collection which is due to be released at Yarndale this year. The collection features twelve patterns inspired by the gardens of Winterfell from the Game of Thrones series by George R.R. Martin. The idea for the book came about from the shows popular catch phrase: "Winter is coming". Every time I picked up my knitting needles with the idea to make something warm and cozy the phrase came to mind. Winter is coming.... better get knitting! There will be seven garments and five accessory patterns in the collection and each pattern is inspired by a plant that could be grown in a northerly climate. The first pattern will be Weirwood shown on the book cover below, inspired by the important sacred trees from the stories. This collection is a WIP (work-in-progess) of its own and I am releasing it in stages. This Friday (15th Sept) the ebook and Weirwood will be available. The next four patterns will be released and added to the ebook over the next 7 days before Yarndale. The remaining seven patterns will be released and added to the ebook over the next twelve months with a final completion in September 2018. The patterns will be available to buy individually and you will be able to convert past purchases of the individual patterns into the ebook at any time. The price of the ebook will be £15.99 whilst the collection is not complete and will rise once all patterns are released. The print version will also be available to preorder from my website shop from Wednesday. The price is also reduced to £19.99 for pre-orders and includes a complimentary ebook on the preorder only. The book will be delivered the week of its release in September 2018. I know this is a long time to wait, but I believe it will be worth it! I released The Chain socks a couple of weeks ago and would like to say thank you for all the positive comments that you have sent! Apologies for taking such a long time to update the blog with the new pattern, I have been very busy with an exciting new collection.... more of this next week. 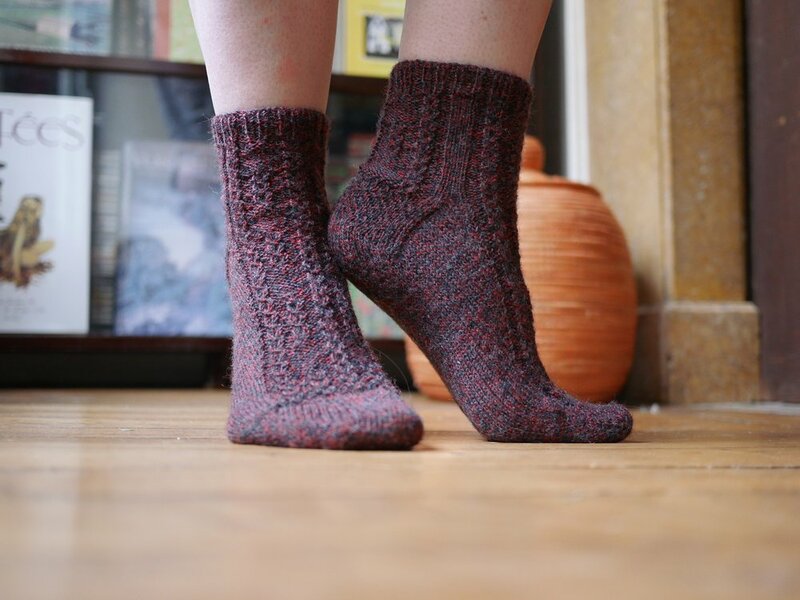 These socks were a request from my step-mum - she wanted socks that were not too fussy, not too long and had a good gusset as her birthday present after trying on my previous sock design Florens. So I set about designing these socks for her. The Chain name comes from the Fleetwood Mac song, Never break the chain and the pattern features mock cables in chains, some of which are linked and some a little broken. The socks are knitted from the toe up and have long gusset increases making these great socks great for people with high arches and wider feet. The pattern is designed for those who are beginner sock knitters as the patterning and structure is simple to follow and easy to customise to fit your own feet. They also have a reinforced heel that ensures the socks will last. I knitted these socks in Lil' Weasel Lil' Sock yarn which looks great and shows off the chain pattern well. My original pair given as a present were knitted in Rico Design Superba Klassik and i love how the different colour changes how the sock looks. The sock pattern can be purchased as a PDF download or as a print pattern through Magcloud here. May the fourth be with you! I love the fun and corny puns and memes this day has and since I am a big geek who loves to share my fandoms with you through knitting and crochet, I am offering 25% off all patterns, books, kits and notions in my Ravelry and online shop today only as a flash lightsaber sale. Use the code MAY4TH2017 on checkout to get the discount. This tutorial explains the technique of Purl When You Can technique and the accompanying pattern gives the opportunity to practice and perfect it. Purl When You Can (PWYC) is a technique to work stranded colourwork from the cast on edge without having to make a cuff. When working in stocking stitch, a cuff is normally added to the top and bottom edges to ensure the edges do not curl when finished. Meg Swansen introduced this technique and it is very useful for when you want the colourwork pattern to reach the edges of the knitting. I have used it in my Caffeic pattern and in the Neck and Neck! MKAL pattern. The basic technique involves when working into as stitch of the same colour, purl it instead of knitting. If working into a contrasting colour stitch then knit it as usual. This only needs to be done in the first (or last) four or five rounds. The purl stitches act like ribbing does to prevent curling, but in a much less regular pattern than ribbing. Caffeic is a free coffee cup cozy pattern that uses this technique. It can be downloaded here. I recommend if using PWYC to use the German Twisted Cast-on technique. I would also work a purl row before starting the colourwork pattern to reduce curling. All stitches are worked in knit. If this was worked as it is, the top and bottom of the cozy would curl up because stocking stitch is slightly longer on the wrong (purl) side than it is on the right (knit) side. 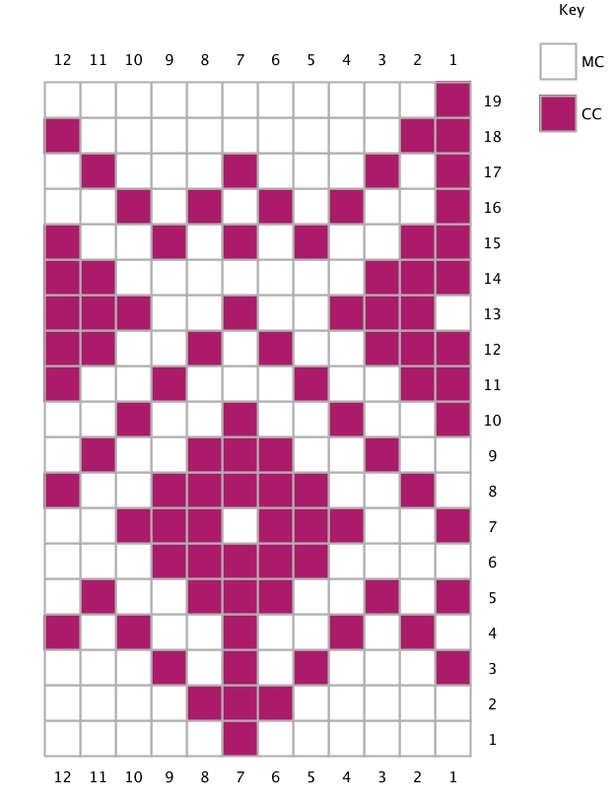 The next chart shows how it would look with 4 rows top and bottom using PWYC. As you can see, the purl stitches are in the main colour only, and only when the stitch below is also a main colour. I could purl all the contrasting colour stitches when they above another contrasting colour stitch, however only a few purl stitches are needed to stop the curling and so the contrasting colour is all worked in knit. When working towards a cast off edge without a cuff, I normally work one purl row before casting off. If any of the stitches in the row below are a contrasting colour then I do not purl these but knit them. This stops the purl bump being in the wrong colour. Finally I cast off in knit, except the stitches that are knitted in the row below which are cast off in purl. I hope you enjoyed learning about Purl When You Can and my free Caffeic pattern.